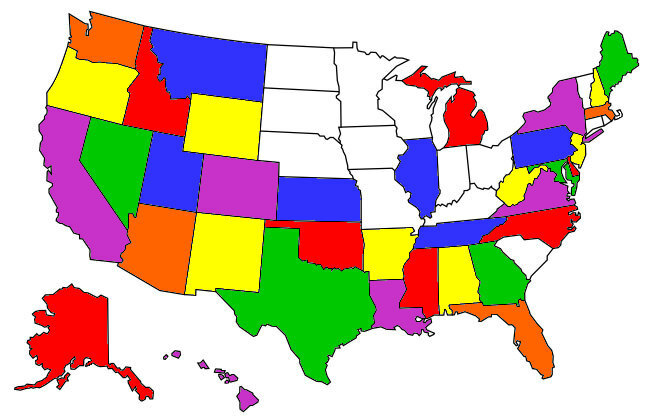 Back in 2014 I made a New Year’s resolution to visit as many new states as possible. By the end of that year the number of states I had personally visited rose from 27 to 33, thanks to an East Coast road trip and a Yellowstone National Park vacation. 6 new states in one year wasn’t too bad. Then in 2015 I added another two states to the list (New Jersey and Alaska). But since then my travel has stagnated somewhat. However, I am happy to announce that in 2018 I have finally added state #36 – Oregon! It’s hard to believe I’d never been there before considering how long I’ve been living on the West Coast. Fortunately I had the outstanding excuse of a friend’s wedding reception to get me there in 2018. It was an extremely short trip, but I had a great time. I arrived in Portland later than I expected the day of the wedding reception due to my connecting flight from Seattle being delayed twice. Yes, I had to fly past Portland to Seattle on one flight only to backtrack to my final destination on my second flight. Very annoying. Knowing that my flight was delayed, I applied my makeup in an extremely crowded Seattle airport bathroom to save myself a little time later. Then, when I collected my checked bag in Portland, I changed into my dress for the reception in a nearby bathroom. I was way behind schedule. I had originally planned to take the train from the airport to my hotel, I had even pre-purchased a $2.50 ticket, but it was going to take too long so I reluctantly took a taxi instead. It took about 30 min and cost $60. Ugh. But I got to the hotel in just enough time to stash my bag in my room and catch an Uber to the wedding reception with some of my friends. Phew! The reception itself was lovely. We ate mini cupcakes as appetizers (genius), deconstructed tacos for dinner (delicious), and tres leches cake for dessert (the best cake I’ve ever tasted). But the most meaningful part was hanging out with my online friends who I don’t get to see very often. Several of them I was meeting in person for the first time, and the others I vacationed with in Hawaii in 2015. (A couple have been to LA since then so I was able to spend time with them at Disneyland, but that’s the exception.) I am so lucky to have found this group of women. It’s remarkable, really. Over the last 13 years they have been there for me through everything, both good and bad. They have changed my life for the better and I seriously don’t know what I would do without them. Flying all the way to Portland for a little over 24 hours was completely worth it. That night after the reception I was exhausted and passed out early after taking a much-needed shower. Unfortunately that meant I missed a lot of shenanigans that happened after hours, including a midnight trip to Portland’s famous Voodoo Doughnut. I am so annoyed that I didn’t get to go, but my body apparently needed almost 12 hours of sleep! The next morning we all headed over to the bride and groom’s house for a donut reception. Yes, more donuts! We had a great time gorging ourselves on sugary pastries, laughing, chatting, and being our usual weird selves. And attempting to ingratiate ourselves with the resident cat, Nibbler. At one point I picked him up to prevent him from escaping out the front door, but he didn’t appreciate that. He bit me several times. (Just little warning nips on my arm so nothing serious.) Fortunately he forgave me later and purred when I pet him. My friends and I reveled in spending all this time together. One of the ladies had already hopped a flight back home, and other folks had to take off for the airport throughout the morning and afternoon, so it was a little sad that our brief reunion was coming to an end. After the donut reception I went back to the hotel, retrieved my bag, hugged everyone goodbye, and started making my way to the airport. This time I was able to take the train and it was fantastic. I only had to walk a few blocks from the hotel to the train stop, the train was clean and not crowded, and the trip to the Portland airport was scenic and relaxing. Totally worth the $2.50 fare (and way more cost-effective than my taxi ride the day before). And I had a direct flight to Orange County this time so my travel home was completely uneventful. I was upset that my trip to Oregon was over so quickly, but I will definitely go back and spend some more time there in the future. It was way too beautiful not to revisit. Plus, I have friends who live there and have a guest bedroom! It’s a shame that my online friends are scattered all over the country because seeing them makes my heart happy. I am going to do my best to organize another get-together next year so that we don’t go three years between reunions again. 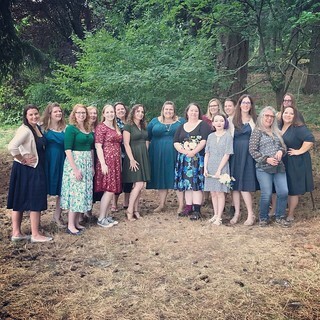 I’m working on another post to share all of the details about my fantastic trip to Portland last month, but I wanted write something about my wedding reception dress choice first. That’s the most important part, right? As the line in A Cinderella Story goes, “In true L.A. fashion, it’s not about who you are, it’s about what you wear!” I wouldn’t be a true Angeleno if I didn’t describe the apparel! As you can tell by the above photo, I ended up wearing my red lace Mormon church dress to the wedding reception in Portland. And it was perfect. Dressy and flattering, yet also pretty and comfortable. Plus, I wore it with my Converse for the ultimate quirky, yet sensible ensemble. I loved it. (I had to change into the dress at the airport because I was so time-crunched before the reception, but I’ll save that crazy story for my other post! Even though I wasn’t flying that far, it wasn’t the most relaxing travel day by a long shot.) So what made me change my mind about the dress? Well, the weather in Portland turned out to be absolutely lovely the weekend I was there so I didn’t need to worry quite so much about getting hot and sweaty. It felt like fall. The high temperature earlier that week was in the 90s (gross), but by Saturday afternoon it was barely 70 degrees when my flight landed in Oregon. The original dress I had selected (I’ll write another post about that one later) was sleeveless due to the possible heat, but with the more temperate weather I was perfectly comfortable in something with two layers and a tad more coverage. I was actually happy to have the elbow-length lace sleeves on my arms when it got cooler that evening. No cardigan or hoodie required! 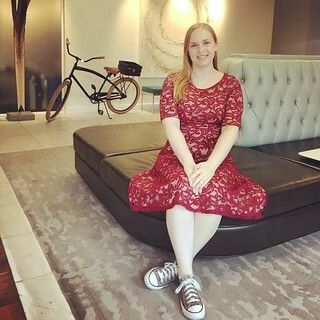 I’m so glad I listened to my BFF and kept the Mormon church dress even though it was a bit fancier, and a bit more expensive, than what I was looking for. I like it a lot more than I expected to, and now I’ll have something dressy hanging in my closet in case I need it again. In fact, I’ve been filling out my wardrobe with a lot more dresses lately because I realized how useful they are while summer is still lingering here in SoCal. More on that in yet another post! Did I just buy a Mormon church dress? I’m leaving for Portland in one week and I need to start packing. I’m only going to be there about 28 hours so I won’t need to bring much with me, but the most important item will be the dress I’m going to wear to the wedding reception. Since I’m flying to Oregon the morning of the reception (thank you, unpredictable work obligations) I thought about wearing my dress on the plane, but instead I think I’ll dress comfortably and then change after I arrive. I’ll travel with a duffel bag rather than a suitcase for such a short trip. (My suitcase has a more important job anyway – it needs to be ready for me to leave on a business trip to DC next Monday morning. Yikes!) I’m optimistically going to bring some workout clothes in case I find a free couple of hours to fit in some exercise. Doubtful, but at least I’ll be prepared. Other than that, I just need a single change of clothes for the flight back home on Sunday. The abbreviated nature of this trip will most definitely make it stressful, but I’m so glad that I have the opportunity to go and see a bunch of my friends who live all over the country. I am certain that we will laugh a lot, eat a lot (my brother has already told me which donut shop is a mist-visit), and take a lot of pictures. It’ll be a blast. In preparation for the trip, I had dinner at my BFF’s house last weekend and I brought four dresses with me so she and her family could help me figure out what I should wear to the wedding reception. 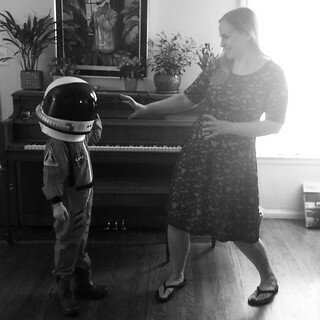 My goddaughter appropriately donned her astronaut jumpsuit and helmet add some much-needed variety to the mini fashion show. 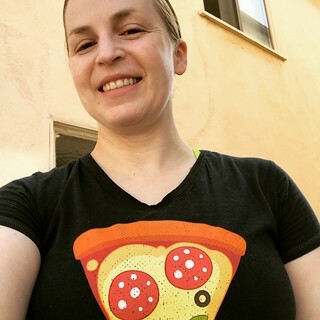 Without knowing what was going to fit or look good on me, I ordered a bunch of options from different stores online, like Amazon and Modcloth. Some of the dresses actually have a funny origin story, including the lace one I’m wearing in the above photo. I have a strange habit of keeping tabs on several semi-famous (or maybe infamous?) Christian fundamentalist families, like the irritating and infuriating Duggars, mostly because I’m fascinated by their views which are so diametrically opposed to my own One of those families has a recently married daughter who maintains her own blog, and in the header photo she is wearing a gorgeous red dress than I’ve been envious of for a long time. Based on the fact that she sewed her own wedding gown last year I assumed the red dress was another one of her personal creations. But recently this woman wrote a post all about the dress and where to buy it – surprisingly, Amazon! I immediately ordered the dress in two colors, red and teal, hoping that one of them would fit me and be perfect for the Portland wedding reception. At the same time I explored other dresses from the same company and also purchased the lace one shown in the picture above. (Sorry it’s in black and white, but the lighting was bad and a color version just didn’t look right.) Turns out the company that makes all three of these beautiful is an LDS modest clothing company. I actually bought three Mormon church dresses! How’s that for a laugh? Much to my chagrin, the red dress that I was so excited about was slightly too small (it was way too tight in the shoulders), and its teal equivalent looked more juvenile than I had hoped (more like my 8th grade dance dress than a 39 year-old woman should wear), so both of them will be going back. The red lace, knee-length dress with elbow-length sleeves, however, is lovely. It is comfortable and flattering. It didn’t come out on top of last Saturday’s fashion show, but my BFF advised me to keep it in case I need a special occasion dress in the future. So that’s how I became the unlikely owner of a Mormon church dress. Next weekend I’ll be wearing a navy blue Modcloth dress to the wedding reception, but you’ll have to wait until then for photos. One more week!